Your choice for Moving and Storage STATEWIDE!!! 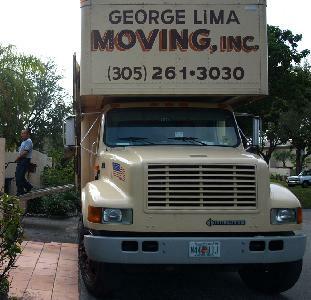 George Lima Moving, Inc is a family owned and operated moving company located in Miami, Florida. The organization opened it's doors in 1984 with experienced movers and has since maintained the commitment to customer satisfaction. Through this dedication to excellence we have earned our client's good word-of-mouth and as a result increased our presence from Jacksonville down to the Florida Keys. Full service moving company serving all of <?xml:namespace prefix = st1 ns = "urn:schemas-microsoft-com:office:smarttags" />South Florida. Moving, Packaging and furniture storage at our warehouse in Dade County.